The Royal Commission into Misconduct in the Banking, Superannuation and Financial Services Industry has started public hearings into superannuation. In the final day of the Royal Commission superannuation hearings we are set to hear from ASIC and APRA, concluding with a summary of policy issues by Counsel Assisting. APRA regulates for the stability of the financial system. So if a super fund is dudding customers or breaking the law, they deal with it… quietly. Deputy Chair of APRA Helen Rowell was asked about a potentially misleading phone call script used by Colonial First State when communicating with fund members, and approved by APRA, which could lead members to make a investment decision and so not be transferred to a MySuper product. Rowell said that it’s “not desirable” that members are misled by fund trustees. Mr Hodge said it should be “unacceptable” to the regulator. Later Stephen Glenfield, also from APRA, said that he viewed a super fund reserve as an asset of the fund and so the members. Chris Kelaher of IOOF had earlier told the Royal Commission that he didn’t regard reserves as assets of the members. In that case the reserve had been used to compensate fund members. Mr Glenfield was shown documents that showed the reserve policy of the fund had been updated to allow for compensation to be made from the reserve to members, though this was done after the compensation was paid. APRA apparently hadn’t detected this as part of their investigation. After lunch Mr Hodge QC questioned Tim Mullaly of ASIC about the action of the regulator in response to ANZ’s ‘A-Z review’ from yesterday. ASIC Commissioner Peter Kell was asked about the use of licence conditions versus Enforceable Undertakings, and fees-for-no-service. Fee-For-No-Service legal action is COMING. Likely over $1-Billion. Questioning of Mark Pankhurst, from ANZ/OnePath, have focussed on the distribuion of the Smart Choice Super through branches involving a ‘A-Z review’. This was subject of an Enforceable Undertaking with ASIC. Richard Allert of AMP/NM Super then took the witness stand. The questioning focused on reporting to the board of underperformance and the returns on cash investments. He was followed by Rachel Sansom, also of AMP/NM Super. The Royal Commission is likely to hear from ASIC and APRA tomorrow. The Royal Commission continued to hear from Linda Elkins of Colonial First State (CFS) in relation to the MySuper transition. The Commission has been uncovering a range of issues with the transition to MySuper funds in retail fund – including slow transition, systems incapable of identifying members required to be moved to MySuper, and encouraging financial advisers to get members to make an investment choice so the member could be kept in a higher fee (and commission paying) product. These issues don’t appear isolated to a single retail fund, and are likely to be put to APRA when its representatives appear before the Commission later in the week. Despite 91% of members being either better off or in the same position in a MySuper product, CFS didn’t agree when APRA wanted the transition accelerated. Counsel Assisting Mr Hodge asked if this was out of concern for the relationship between CFS and advisers. Questioning then moved on to the returns and commissions paid on cash investments, the competitiveness of CFS insurance premiums, and fees charged to deceased customers. In the afternoon the Commission heard from Peter Haysey of Catholic Super, in regards to a failed fund merger. Questioning then moved to conflicts of interests – where a spouse and a relative of a Catholic Super executive worked for organisations from which the fund bought services, but this conflict wasn’t disclosed for years. Mark Pankhurst and Victoria Weekes – both from ANZ/OnePath – are listed next on the witness list. The Royal Commission is set to continue to hear from Mr Pinto from Suncorp. Free Legal Advice: Answer the #BankingRC‘s questions… or they will just ask you again. Counsel Assisting Mr Hodge asked if the true administration fees were disclosed that the disclosed fees would rise. Mr Pinto said it would depend on the disclosure. Mr Hodge asked if the Suncorp super fees were already high relative to competitors. Mr Pinto said he wasn’t sure. The Commission had asked Suncorp to justify its claim on its website that its super fund was ‘low-fee’. Mr Pinto said Suncorp was removing the claim, to align it with description of ‘competitive’ in the PDS. Questioning then moved to the timeliness of Suncorp’s transition to MSuper products. Mr Hodge asked if an email was encouraging advisers to get members to make an investment decision – which would mean they would say in commission-paying Choice products instead of moving to MySuper. The next witness was David Elia of Hostplus, followed by Linda Elkins of Colonial First State (CFS). The CFS questioning is initially focused on MySuper, including encouraging members – at times through misleading call-centre scripts – to make investment decisions so members wouldn’t need to be moved to cheaper MySuper products. Elkins is set to return to the witness box at 9:30am on Wednesday. The Royal Commission has started day six of the superannuation hearings by moving to the topic of the difficulties around superannuation faced by Aboriginal and Torres Strait Islander people. The Commission heard from Lyn Melcer from QSuper on this issue. Questions by Senior Counsel Assisting Rowena Orr about the impost of additional and more flexible processes suggests the Royal Commission could recommend more super funds follow the lead of Qsuper. Melcer was excused and, after a short break, Andrew Hagger of NAB was re-sworn in. After Mr Hagger was excused the Royal Commission heard from Maurizio Pinto of Suncorp, seemingly relating to how the fund handled a surplus from insurance. Mr Pinto is set to return to the witness box at 9:30 am tomorrow. The Banking Royal Commission has spent much of the first week of superannuation hearings focused on questions around the best interest of members. Senior counsel assisting Michael Hodge QC told the Royal Commission on the first day of the super hearings that super fund trustees are “surrounded by temptation”. How can it be in the best interest of members to continue to pay fees when they don’t need to pay the fees? Or how can it be in the best interest of members to not be fully compensated for fees for no service? How can it be in the best interest of members to continue to pay commissions they don’t need to, including for no service, when the super fund is concerned that ceasing commissions could lead financial advisers to recommend clients move to another fund? Mark Oliver, General Manager of Distribution for IOOF, has continued in the witness stand. The questioning seems to relate to payments between entities and grandfathering provisions, including volume-based and shelf-space fees.. Counsel Assisting Hodge QC took Mr Oliver through a number of issue with his statement to the Commission, and asked if Mr Oliver thought his answers would be helpful to the Commision – he said he had “general knowledge”. Mr Hodge said the Commission had suggested Mr Oliver was not the appropriate person to answer questions, but IOOF insisted. The Commission viewed Christopher Kelaher, Managing Director of IOOF, as the more appropriate witness. Kelaher is listed as the next witness. The Commissioner has been critical of IOOF’s production of documents. essential to the proper execution of the Commission’s work. Delays of the kind that have occurred in this case impede the proper work of the Commission. Ill based claims for privilege further impede its work,” said Commissioner Hayne. Kelaher has now taken the witness stand and being asked about the board structure and practices of IOOF. The #BankingRC asked for minutes of last week’s board meeting of IIML (part of IOOF). There is no recording, and apparently only HAND-WRITTEN NOTES of the meeting, which we’re looking at. Concerns with Dual Regulated Entities (DRE) – a company is both the trustee of a super fund and responsible entity for Managed Investments Scheme/s (MIS) – are raised. Later the questioning turns to how members were compensated, following from an over-distribution that was then recovered over time. Some of the compensation appears to have come from a reserve of the fund – compensating members with their own money. After lunch, it appears that this is not the only time that IOOF used a reserve of the fund to compensate members of the fund. Kelaher said that it was not his understanding that a reserve of the fund was an asset belonging to the members. Mr Hodge put it to Kelaher that Questor (IOOF) hadn’t displayed an understanding of its best interest duty to members, or its obligation to prioritise the interests of members over those of Questor and related entities – to both of which Kelaher answered “I don’t agree”. The fourth day of the superannuation hearings opened with the Commissioner refusing NABs request for non-publication directions. Nicole Smith then continued to give evidence. Ian Silk, CEO of AustralianSuper, is listed as the next witness, to be followed Mark Oliver and Christopher Kelaher of IOOF, if time allows. In the afternoon the Commission moved on to Mr Silk, though seemingly may return to the NAB/NULIS case study. Questions put to Mr Silk revolved around the tenure and compisition of the super fund board. AustralianSuper currently has only one independent director. Mr Silk said the fund was open to more independent directors, but prefers skills over a quote – such as the Government’s proposed minimum one-third independent directors. The Commission then moved on to the ‘investment’ by AustralianSuper in the publication The New Daily. Though AustralianSuper doesn’t regard the shareholding as an investment, but rather a “tool to enhance engagement with members,” in the words of Mr Silk. The money put into The New Daily was paid from the same fee that pays for marketing expenses. The final topic covered on day four of the superannuation hearings was the ‘fox and henhouse’ ad campaign. This ad was released in early-mid 2017 and aimed at heading off potential changes to how default super funds are selected. At the time the Productivity Commission was working on a report on how default funds were chosen. Mark Oliver, General Manager of Distribution for IOOF, briefly took the witness stand at the close of the Thursday hearings. The line of questioning appeared to relate to if the payment of commissions was in the best interest of members and grandfathering. On Wednesday the Banking Royal Commission continued to hear from witness Nicole Smith in regards to NULIS. The focus of the questioning was on fees for no service, how it can be in the best interest of members to continue to pay commissions when they don’t need to, and the speed – or lack thereof – of transition to MySuper products and their relative performance. Late in the afternoon the Commission switched witnesses to Australian Super, with Nicole Smith to return on Thursday, due to a question of confidentiality. Jason Peasley, Head of Mid-Risk Portfolios with the industry fund and formerly Head of Infrastructure, is being asked about Australian Super’s investment in Pacific Hydro, through fund manager IFM Investors (formerly Industry Funds Management). “The sale of Pacific Hydro by IFM. The sale of Pacific Hydro, in January 2016, by the IFM Australian Infrastructure Fund delivered the Fund proceeds well above Pacific Hydro’s carrying value and at an exit multiple of 22 times Enterprise Value/EBITDA, above other industry comparables. Ian Silk and Jason Peasley, both from Australian Super, are listed on the witness list for Wednesday. Mark Oliver and Christopher Kelaher, in relation to IOOF, have been added to the witness list. The Royal Commission is expected to continue to hear from witnesses relating to NAB super trustee NULIS. Michael Hodge asks Ms Smith whether she was aware of a range of practices and issues within MLC in 2015, she tells the #BankingRC she was not aware. She was the chair of NULIS, the trustee for MLC customers, at the time. Nicole Smith, former Chair of NULIS is set to return to the witness box on Wednesday morning. The Chief Executive of Australian Super Ian Silk and Jason Peasley, who appears to have a role with Australian Super’s infrastructure portfolio, were scheduled for Tuesday but the Commission is running behind schedule. Their appearance seems to relate to the investment by Australian Super in Pacific Hydro through fund managed by IFM. The Government has announced that ASIC will receive $70.1 million in additional funding to ensure it has the “resources and powers it needs to combat misconduct in the financial services industry and across all corporations for the protection of Australian consumers”. “This new funding will bolster ASIC’s enforcement capabilities and enable it to undertake new regulatory activities and investigations, so as to better deliver on its mandate of combating misconduct in corporations and in the financial services industry,” said a joint statement by the Treasurer and Minister for Financial Services. This follows from ASIC’s decision to “re-focus” on “proactive enforcement and increase onsite supervisory approaches”. The funding includes $26.2 million for the enhanced pursuit of serious misconduct by “well-funded litigants” and $9.4 million to boost supervision of the superannuation sector. ASIC staff will also be embedded in the big four banks and AMP. As the Banking Royal Commission was asking about fees for no service in relation to NAB’s superannuation trustee NULIS, ASIC provided an update on the refund programs from the banks. “AMP, ANZ, CBA, NAB and Westpac have now paid or offered customers $222.3 million in refunds and interest for failing to provide advice to customers while charging them ongoing advice fees,” said ASIC. NULIS Nominees – which was the first case study before the Royal Commission in its superannuation hearings – has paid or offered almost $36 million in compensation, with a further $67 million estimated for a total of $102,900,408 in compensation relating to general advice. 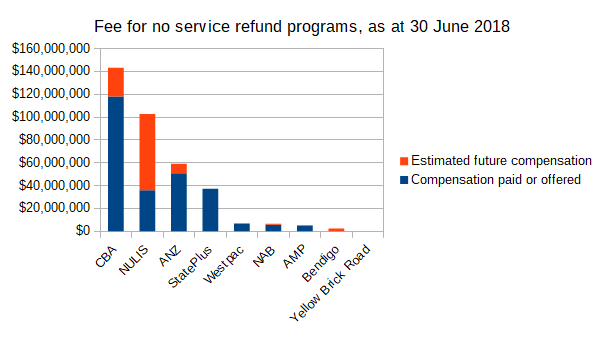 All up, the refunds for fees for no service are currently estimated to be $364,264,630. However ASIC also says if provisions made by five organisations are paid in full the fee for no service remediation may exceed $850 million. ASIC says it will continue to monitor the fee for no service compensation programs. “Trustees are surrounded by temptation,” Senior counsel assisting Michael Hodge QC told the Royal Commission on day one of the superannuation public hearings. Hodge said that a review of documents had found fewer examples of potential misconduct, or conduct below community standards, or inappropriate use of retirement savings from industry funds compared to retail funds. There will be no consumer witnesses in the superannuation round of hearings, as this “reflects the nature of the matters that we are investigating”. Unlike earlier rounds of hearings the superannuation hearings will not conclude with findings about specific entities, but instead a summary of policy issues. The first day of the public hearing focused on NULIS, the superannuation trustee for NAB and MLC super funds, around the level, disclosure and grandfathering of fees. MLC Super CEO Matthew Lawrence said the fee was being refunded because MLC hadn’t clearly communicated to customers that thee fee could be turned off if they weren’t using the general advice service. Oh dear, the #BankingRC hears the word “context” for the first time today. This is where “context” generally appears to be bank code for justifying misconduct or behaviour that falls below community standards. What does the Banking Royal Commission want to know about superannuation? The structural and governance arrangements that exist for trustees. The making of payments by industry funds to their sponsoring organisations or affiliates of the trustee to assist, or purportedly to assist, with the marketing of their funds. The continued payment of grandfathered commissions by retail funds. The approach of trustees to members who have multiple superannuation accounts, in the same fund or a different fund. The ways in which funds monitor the performance of the products that they are offering and how they engage in performance attribution. The way in which trustees go about carrying out their statutory obligation to perform an annual MySuper scale test. The transfer of accrued default amounts to a MySuper product. The consideration of cash returns by certain retail funds. An entity within a retail group receiving payments from third party managed investment schemes where those payments are calculated by reference to the investments of the super fund. The appointment of directors to the boards of corporate trustees of industry funds. When is the interim and final report of the Banking Royal Commission expected? The interim report is expected in September, with the final report due by February 2019.